This vintage shows richness in depth, focus and purity of Pinot Noir aromatics, with tiers of concentrated black cherry, wild berry, raspberry jam and plum. Fleshy and full-bodied, the wine ends with firm, yet supple tannins. 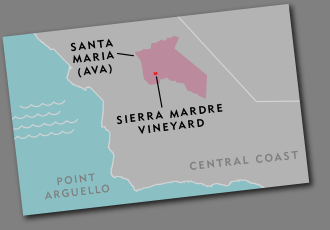 In 2011 we produced 5 barrels of the Highflyer Pinot Noir from Sierra Madre. The wine was aged on lees for 14 months in 30% new French oak and 70% neutral French oak. This great vintage shows richness in depth, focus and purity of Pinot Noir aromatics, with tiers of concentrated black cherry, wild berry, raspberry jam and plum. The 2011 growing season was near perfect and grapes were harvested in late September. Sheltered by the mountains, the sunshine was plentiful and strong resulting in balanced amount of fruit on the vine. The long growing season allowed us to develop flavors while retaining the refreshing acids common to the region.